Keeping kids occupied as they wait for their meals can be tough, but this Choice 4 pack kids restaurant crayons is great for doing just that! Be sure to stock up on crayons in bulk so that you always have an entertainment option for your young diners. Each 4 pack of crayons includes one each of red, yellow, blue, and green. With 100 packs in each box, you'll have plenty on hand for the busiest of days. These restaurant crayons are non-toxic and lead-free to keep children safe. These are great crayons for a great price! We liked that they came in individual boxes instead of plastic. Four basic colors that keep the kids off their phones and electronic devices! Choice 4 pack of restaurant crayons are an awesome buy to give out to the kids at the restaurant. Crayons work really well and the packaging is nice. These are fantastic packages to give to families when they dine with us. We get coloring books from thrift store to pair with these crayons and it really helps the kids enjoy their time more at our restaurant! We used these crayon packs for a special event at our coffee shop. They worked great and the kids loved them. We still keep them in case there are bored children looking for something to do. Would definitely buy again for the price! These are great. The kids love them. We give out coloring sheets and we get back beautiful pictures and happy kids. What more do you need? We use these for all of our kids meals and they work very well for us. We would definitely recommend using these in your restaurant! These perfect and inexpensive crayons are ideal for placing along side of a child's menu. They come packaged in a cute little box at only pennies per unit! We really liked the 4pc color options, and so did the kids in the restaurant. good quality, NO broken crayons on delivery like some of our other orders from other sites. We will keep reordering these. 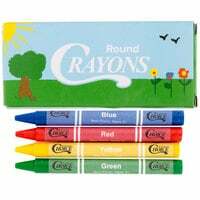 A great four pack of crayons at a wonderful price and great for our kids' menu. The colors are great and the crayons are wonderful quality. The boxes are bright and fun for kids. The crayons are individually labeled with what color they are. They write very well and are easy to use. Overall, a they are a good way to keep kids busy in a restaurant! These crayons are great, the 4 packs are good, but not necessary, the 3 packs are fine and much cheaper, kids love using them on the butcher paper we have on tables, or we also give them paper chef caps to write on, we keep the unused ones in a big bin for larger groups of kids, or drunk adults. These crayons worked really well for our guests that needed entertainment. The packaging is frustration free for all ages to enjoy. They do not break easily and we will surely reorder before we run out! The choice 4 pack kids restaurant crayons -1000/case work great and kids love them. We give them out to all the kids with interactive sheets to keep them busy. We love this product! It is perfect for our restaurant because they are cheap enough that we do not have to reuse them and the kids can take them home! These are perfect for keeping the kiddos entertained while waiting on their meals to come out. They are made very well and we will definitely order again! These crayons are great to give out with our kid's menu. The great thing about these is they included red & green and those were the perfect colors for our Christmas contest! Good quality crayons for a very affordable price. Have paid more for three pack crayons on other sites. Items shipped quickly and arrived in excellent condition. Would purchase again. These crayons are perfect for our little customers. Good quality. Low price makes it easy to afford. We have been passing these out for 8 months and will continue to do so! my customers love using these crayons. The quality is spot on ,and the packaging is perfect for restaurants. I love this brand highly recommended for children or adults. A nice set of four crayons to keep the kids occupied while the food is being prepared. We love the small box them come packaged in. I got these for kids at catering events. Great price as I know I'm only coming back with a third of the box each time. Keeps them entertained on white paper table cloths. I bought these crayon packs for kids when they come to our restaurant. They are a great value at the price I paid and the kids love them. These kids crayon packs were perfect for our restaurant. We coupled them with coloring place mats and the kids are happy. We've had several "artworks" turned in and we display them proudly. The pricing is exceptional. Our little customers love these 4 pack crayons. The quality is excellent and colors are bright. We will definitely be reordering these in the future! The Choice crayons are a good value for a restaurant that provides them for kids. They are shipped in Compact boxes for easy storage at a hostess station. These crayons are great; they come packed four to a box. They come ready to go and the kids love them. Our hostesses just have to hand them out. The perfect item to keep little hands busy while waiting on their meal! The colors are not too dull, unlike others we've used and they are easy to clean up after if some get on the tables. I have purchased these crayons a couple of times for our customers with children to entertain them during dinner. The kids love them! Great value! Just right for what we needed. Good value. Packaged with just enough to give out and not go over our budget. I would say good choice. A box of these is a very reasonable price since most of the time, we end up throwing them away when the kids are done eating. The write just fine. I have used really cheap crayons before that barely leave color on the paper but these are fine. Bought these crayons for use in my lake-side restaurant. They also come in a similar 3-pack, but I figured I'd give the 4-pack a try. Great quality, and very nicely packaged. Overall, and huge value! We are very pleased! These are the perfect item for kids coming in the restaurant. Just ripped the top flaps of the box and sit with your coloring sheets/kids menu and you're good to go. Reusable if the kids don't take them home as well. Definitely beats buying name brand crayons at the local big box store. Perfect for children when they are waiting for their order in our restaurant. Parents enjoy them also. Product came in fast! Will be ordering them again!! A very economically priced crayon pack. Delivered exactly as promised. I paid only a fraction of the price my local food hobby store would have charged by purchasing on Webstaurant Store! I bought this so our little one can keep the self occupied while their parents are enjoying their meal just wish it had brown since our piture contains trees. Great price and quality. We always try to combine orders to lower shipping cost. webstaurant is our first choice for all of our disposables and dining room supplies. This was great & cheap to find definetly keeps the kids distracted having crayons & coloring books & we still have finished the whole box yet! This was a great buy! The kids love these crayons, the colorful packaging is very attractive. They are very affordable for us to keep in stock and they work great! We use these as prizes for kids. I work at a school and these crayons cost a fraction of the cost that crayons cost from a school catalogue. It is a great deals for me and kids love the little gift. Thanks for the great deal. An added bonus for your little customers. Includes the four basic colors in a sealed pack. They leave with a great meal and something to do at home. I love them a great item for the kids to have, I purchased these to give away to give to kids when they get a coloring book they get free Crayons. the kids love it!! Great produc for the price. No problems with these crayons and the kids really like them. We will not hesitate to order them again. Thanks again webstaurant. These keep little hands busy and allow parents to dine in peace. We prefer the cardboard over the paper wrappers because they don't blow all over the patio. These crayons are perfect for our restaurant. They are easy for kids to unwrap for use and the box provides a way for the kids to take the crayons home. Came back to order more crayons for our littlest customers. Each child gets their own box of crayons to use and then they can take them home. These crayons are great - but let's be honest - kids only use them once and then they get thrown away. I wish for the restaurant's sake a company came up with a better solution! These Choice 4 packs provide a cost effective solution to accompany our kids menu. The neatly organized boxes provide a perfectly clean crayon set for kids. Kids love them! The crayons Is a great item to entertain children. They are great for restaurants, small events and parties. Perfect size to put in party bags or give out during the holiday season. Good Quality crayons, and a great price! These keep children busy with our paper children's menu. The case size is compact and doesn't take up too much space. This are perfect in gift bags for birthdays or holidays. I used some in my child's Halloween bags for school since they wanted less candy. Worked out good. Great way of ordering your crayons for kids. Fair price and they are individually wrapped for the patrons enjoyment. Cant go wrong with these. Highly Recommended! We got these Crayons for our wedding, and they are great to use there. The kids loved that they had all 4 colors, and some adults even joined in on the fun too. They are bright crayons and seem to be good quality. These crayons are a great price as well as being very good. They color very well and kids like them. We use these all the time to hand out with our kids menus! These are the best fro size and price. They are perfect to go with our kids menus and are priced right in case the guest decide to take the crayons with them. Bought some logo coloring books for our bank and needed crayons to go with them. These were perfect and at a cost much more reasonable then anywhere else! Glad I found this website for business, as well as personal use! Great product for the price. Kids enjoy having these to use and I like that there are more than 2 colors. I like giving kids the option to be creative! We went when the 4 pack after kids kept asking for more colors. This has satisfied the need! easy open and easy to throw away (the plastic package ones can get blown around. Good quality crayon - we will continue to buy these! Great value found in this 4-color crayon set. Delivers lots of color options and keeps kids entertained while waiting for their food to arrive on the table. Kids get a sample of colors, They are happy which makes their parents happy. They stay longer so sales go up. Great Product and inexpensive. A must have. These small boxes of crayons are convenient and cost effective. They help entertain kids and keep them under control in a public setting. Great item to keep the kids occupied, combine it with a coloring sheet and you have time to prepare orders and avoid children become destructive while they wait. Perfect disposable set of crayons for the little kids. We use them on a regular basis and it is sufficient for our small restaurant needs. These crayons are perfect for quiet time. I can give each child their own pack with a coloring book or piece of paper and it keeps then busy and quiet for awhile. Kids love the crayons. Four crayons gives them an option when coloring on our kid menus. The price allows us to be able to supply crayons to each child and promote a family friendly environment. These are great to hand out to the families that come into restaurants with kids in tow. As long as they have something to do, the kids will stay occupied and allow the family (and those around them) to enjoy their night as much as possible. We held a kids night a little while ago and we ordered these along with mats for them to color on. I must say they loved it! These crayons worked like a charm. Well worth it in my opinion. My family and I like the Choice 4 pack kids reswtaurant crayons. The price is great and even better when my sister's and I split the cost. The Choice 4 Pack Kids Restraunt Crayons sold 100 per Box. They are great and each pack containes 1 Red 1 blue 1 Green 1 Yellow crayon. They also make great party favors. These crayons are great to have on hand when children enter your establishment! They are also great on the line, my expo uses these all the time to mark tickets! The best part is, they keep the kids quite for at least ten minutes, until the spoiled little brats start playing with their own ipads! Hey it's worth a try! Great crayons to purchase. We have white roll paper over our linens so that kids can draw on the table. This crayons are perfect and the colors are great! These are great and the kids at my place love them. we keep pages to color printed up and these Crayons are priced so good they can have a new pack every day. If you want to keep kids happy while waiting for there meal this is it. these crayons go good with there place mats. Great Price! These are a nice inexpensive set of crayons for kids to use on our color placemats. These come packed very nicely and compact. Also these are much cheaper than our previous crayons. This is your selling point for kids. These crayons are vibrant colors and they get to take them home too. It's an inexpensive way to make the kids happy. very very inexpensive. These are great for family style restaruants. Especially if you have coloring sheets too and not just blank paper for the kids to color on. Quality crayons at a super price. Contain the four standard colors, unlike some that only have three. The easisiest thing to keep the kiddies entertained while they wait for their meal. The reatraunt 4 pack kids crayons are great for the little ones at the table and goed well with the place mats ,give's the little ones something to do. These crayons are a great inexpensive way to please children! Bright colors are great for coloring drawings! Keeps children busy! Plenty per box! Great price!! we bought this for kids with the kids' activaty paper. kids loved to play with it. they are well packed and nice quality. thank you! Great for reataurant and very great price! I will definitly by more, I love this place! I hope the continue to add more great items! This item is great. They have been a hit with the kids and the quality and texture is similar to those of name brand crayons. I used these as giveaways attached to my business card at a craft fair I recently participated in. Because they were so inexpensive, I tested them out with my 3 and 5 year old children beforehand to make sure the colors were vibrant, unlike some of the "cheap" restaurant crayons we come across, and they were. These crayons are great! !